Do you often have pain that seems to travel down your back all the way down to your feet? This could be sciatica and it is a very common condition. Most people think that they have to live with it and treat the symptoms, but a chiropractor can actually treat the problem to allow you to live a pain free life. Even if you have never visited a chiropractor before, it is something to be considered, as they can restore health to your body. I had never been to one, but it was the best decision that I could ever have made for myself. 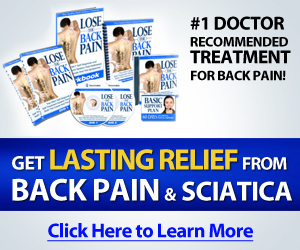 Why should you go to a chiropractor for sciatica? If you are unsure about going to a chiropractor, let me give you some advice. Do your research. You will find a great deal of scientific basis behind the care that a chiropractor can give you. You will also find testimonials from people who have overcome major conditions and pain to finally be able to live their life. I did my research on sciatica and chiropractic care and even though I was still a little hesitant, I decided to make an appointment. I am so glad I did. The doctor first explained what sciatica is. “The sciatic nerve is the longest and largest nerve in the body. It goes from your lumbar region all the way down to the back of your knee and if there is any entrapment anywhere along the nerve, you will feel pain and/or numbness all along the nerve region,” says Dr. Brian Abelson. This made sense to me for the first time. I had not understood why I could hurt all the way down my leg, but he made it make sense for the first time, which gave me hope. After he had explained everything, he explained the process of adjustment to me. Manipulating the body and putting it into the correct position is the goal of a chiropractor. Due to normal wear and tear on the body, it can get out of alignment, which causes pain and a myriad of other problems. This was the reason for my sciatica and the doctor was able to treat much more than just the symptoms. He could treat the cause, so that I would not have to worry about it again. This was the answer I was looking for. I was so glad that I had no long term damage. I was finally getting back to my life. Living with pain is not something that anyone should have to do. Even if your regular doctor says that there is nothing that they can do without surgery, get a second opinion to find a way to relieve lower back pain. A chiropractor may be able to treat the cause, rather than the symptoms, to finally get you back to living the life that you were meant to lead. Find a chiropractor in your area and ask for references. If they check out, then make an appointment for a consultation and see what they have to say. You may be surprised to learn that they deal with this condition all of the time and are able to help you to finally feel better. Do not just settle for living with the pain. Get the help you need to head off any long term damage and to get back to being active. You will be glad you did. Melissa Cameron is a freelance writer who lives in Austin, Texas with her family. She discovered the Internet back in 2003 and loves to research. Melissa is currently writing a series of articles on back pain and the importance of developing an ergonomic work space with the assistance of a Appleton WI Chiropractor.